We got here yesterday after staying two nights at Pukaskwa National park, we had tried to get in to Neys but there were no campsites available that we could fit into. It seems like the north is more busy this year compared to previous years. 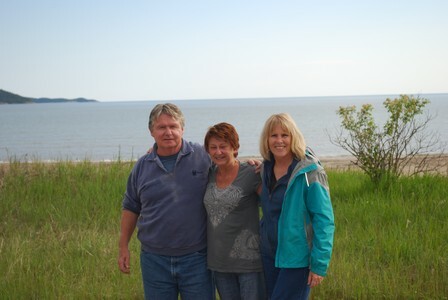 We had a large improved site in Pukaskwa which was good. 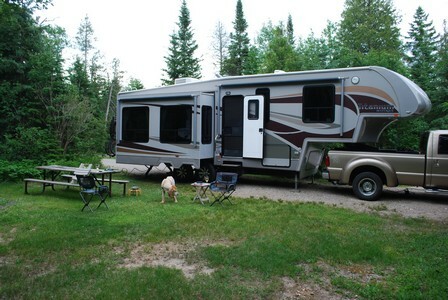 One thing that's important for Rvers to know is that Pukaskwa has a problem with electrical power for campers. Although the pedestals are rated at 30 amps, if you try to use more than about 15 amps or so the voltage drops to a low level. Our surge guard cut off power when we tried to use the fridge and the water heater at the same time, running an air conditioner is out of the question. We used up some propane powering these two appliances. 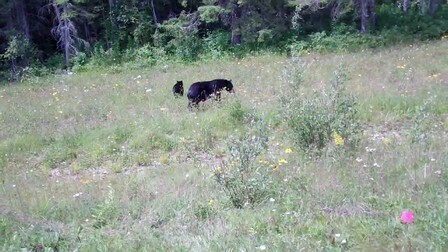 The cub is heading towards the bush! Here at Rabbit Blanket we are camping in a site that we haven't been in before (#30), it's a large site that is away from the water but close enough to look at, we like this site. Tomorrow it's back to Massey for one more sleep then we are back home! We arrived here yesterday afternoon, as usual we didn't reserve ahead as we've always been able to get the site we wanted. Not yesterday!! The KOA was basically full, we got a 15 amp site with water and sewer, it's the first time for a 15 ampsite since Mexico. Al had to dig out the 15 to 30 amp"dogbone" adapter to hook up the power. Since we have to do laundry, power management was required, the breaker blew with only the fridge and water heater on electric. 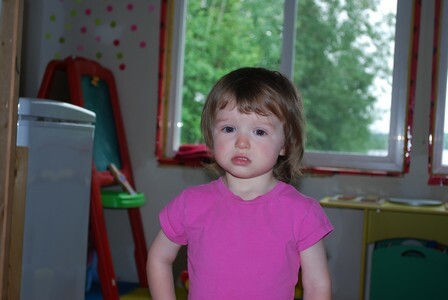 So, when we are doing laundry only the washer/dryer is on electric, the water heater and fridge are on propane. The thing we really miss is the air conditioner, it's been in the high 20's and the camper doesn't cool down until near midnight (but we are surviving!). We stay tonight then it's back to the Marathon area. There is a red plastic "handle"with 2 slots cut into it. These slots (they are covered by black electrician's tape in the picture) are designed to prevent back flow of sewage into the park's water system. 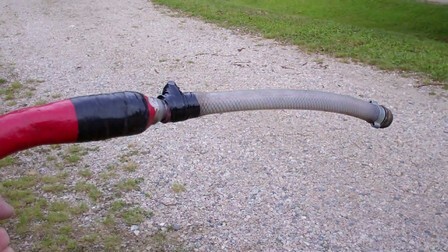 In addition, a camper has also installed a hose fitting at the end to connect to the sewer flush fitting on his RV. The back flow function has been completely negated, sewage can now get back into the park's water system! The solution of this modified fitting that the parks folks came up with is caused apparently by some "asinine" standard that CSA (the Canadian Standards Association) developed. The standard back flow preventers seen in many private parks are now required to be checked annually by a competent person or organization, meaning that for the parks each preventer has to be removed, sent away, tested, returned then installed. A simple check (turn off the water supply, if water drains from the openings on the side of the preventer than it's good) apparently isn't sufficient for CSA. This is an extremely high cost item for the parks, so the provincial parks folks developed the "work around" to avoid the costs. As a result of this stupidity, folks are now less safe than before the CSA regulation. By the way, the reason that the fitting in the picture has been modified (by campers, not the park folks!) is that a lot of RV's have to be pressure filled to fill their fresh water tanks, and the sewer flushers similarly require a pressure fitting. 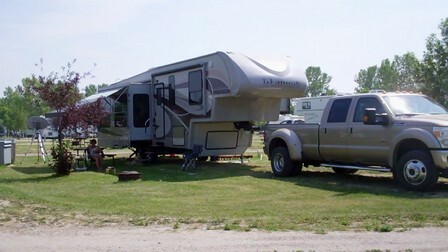 If these RV's are hooked up to the park fitting pictured (before modification), all that happens is that water flows out the sides, no water gets into the RV. Hence the reason for the modification. 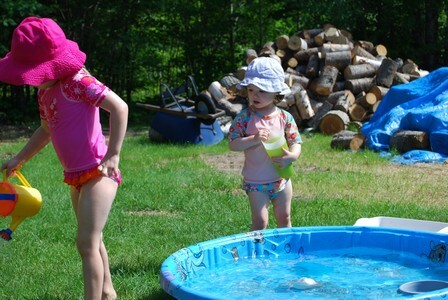 In an effort to comply with the new regulation, the provincial parks have also removed all the hose bibs from the water taps throughout the parks, if you have a camper that requires pressure filling you don't get any water!! Bottom line is that the hazard has increased significantly because of poorly written regulations. I'm sure CSA doesn't read this blog but they should think about the effect of the poorly written regs have! We got here yesterday after a relatively short run from Vermilion Bay where we stayed for a night after we left Winnipeg. There was a lot of rain the night before we arrived, the grass was soggy and the road into the campground had been partially washed out, the weather folks said that the area had 70 mm of rain. Here in Sandbar lake the weather has been excellent and it's been cool overnight (12C) so it's great sleeping weather. The campsite is mostly shaded (with just enough opening so that the satellite internet and the satellite TV can be received!). 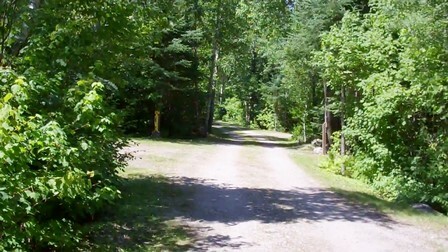 This is the road between campsites, lots of privacy! We are here for another two nights then it's back to Thunder Bay. We even have a small tree that helps with the shade! We are also being serenaded by some Mexican music, not too loud but a great beat. We are staying here for two more nights then it's back to Ontario. 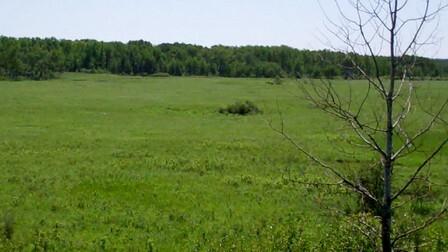 There is a large meadow in front of the viewing platform with lots of grass. The Bison had been there and left their "calling cards" but none were visible. The other notable thing was that there was a tornado that had gone through the area relatively recently, a large number of aspen or birch tress had been completely de-headed, about half way up from the ground. We didn't hear about the tornado, it occurred in an unpopulated area so maybe wasn't reported. We continue to enjoy our stay here, we will start packing up on Thursday and leave Friday morning. We continue to enjoy it here at Riding Mountain, we've taken a couple of longer walks to and from town (although enjoying a "farm portion" lunch in town didn't do anything to reduce the waistline!). We've also biked around,we are getting our legs (and behinds!) in shape after not riding for a couple of years, Suzette's new bike is working well, it has lots of gears. We've also had campfires almost every night. We went into the village near the park this morning to gas up, get a few provisions and a Lotto Max ticket (100 million draw tonight!). Upon gassing up (full service diesel at $1.149 per liter!) I talked to the gas jockey whose main job is working at a company that repairs vehicles. He indicated that he modifies late model diesel pickups, taking out the urea tank and the catalytic convertor, then the engine computer program is modified to run without the emission controls. He indicated that a late model Dodge Cummins gained about 6 MPG without the emission controls. Since they have no smog testing here they can get away with this modification. It's not really rocket science to do the modification, the auto manufacturers offer the new diesels without the emission controls for export sale. I'm sure the modification is how the export vehicle are set up. That's one advantage of living outside the city. For the other advantage, I need to tell you about a recent stop in Erickson, it's a hamlet that call's itself a town about 15 km. south of the park. I don't know exactly what the population is (maybe about 1,500) but it is well equipped with a good co-op store (grocery store, hardware, gas and lumber. The town also has a good health center, a pharmacy and a credit union and RBC has a presence there. It seems to cater to farmers in the area. There are major health services in Brandon (less than 100 km.away) and Winnipeg is also an easy drive from here. The price is only $12,000. Wow!! 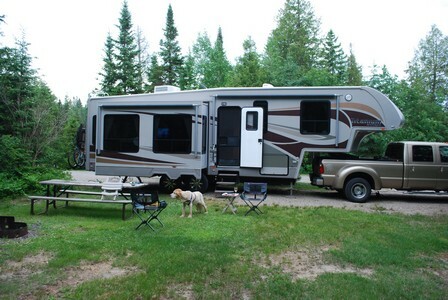 It almost gets Al thinking about building an RV port as our summer home location! If Al can figure out how to do a link to the scanned PDF document on the server here, it will be posted. 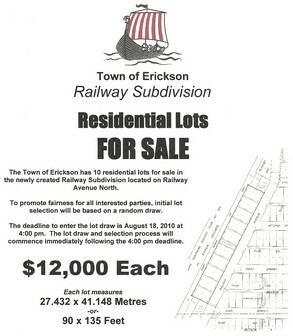 the lots have been for sale since 2010 but only 2 of the 10 have been sold. The equivalent lot in a city in Ontario would beat least $200,000. The picture below is a scan of the document, if anyone is interested in the full size PDF, please E-mail us. We have been relaxing here and enjoying the park. Al has been a bit under the weather with a summer cold so he's been doing more relaxing than moving around (but it's getting better!!). We walked into town on Canada Day to see the activities (it was very busy, they don't charge for admission to the park on Canada Day). We had hoped to grab some lunch at a restaurant but there were lineups so we came back to the campground, we enjoyed the live bandstand music from the comfort of the campsite. 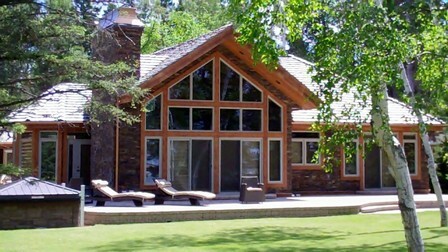 This is a shot of a new cottage, it's right on the lake close to the town site, it's the one that Suzette says is the "ideal" cottage. The enclosure on the bottom appears to be the cover for the hot tub! We arrived here yesterday afternoon and got our site even though we arrived here a day early, the site was available! The Garmin GPS took us to the east entrance of the park (a ceremonial entrance), there must be an old wooden bridge somewhere along the road into the park from the east entrance as there was a weight restriction of under 3,000 kg. Not enough even for the weight of the truck, not considering the trailer weight! The result was a 50 mile back track and some hill climbing on a road called Mountain Road (not a real mountain but some exercise for the diesel!). Message to Al - don't rely exclusively on the Garmin directions - repeat 3 times! The weather is great although a bit breezy, the sat internet is being bothered by the trees when the wind moves them into the dish's path to the sat. 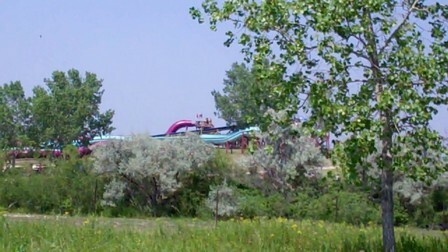 The park is very quiet but it will be different tomorrow when the Canada Day weekend crowds arrive. This picture was taken yesterday before the dish was moved this morning, we had sat internet but not TV, the jury is still out on whether we will get all the channels, one of the sats is still partially blocked by trees. Kasey has found his preferred spot (except when the fire is on! 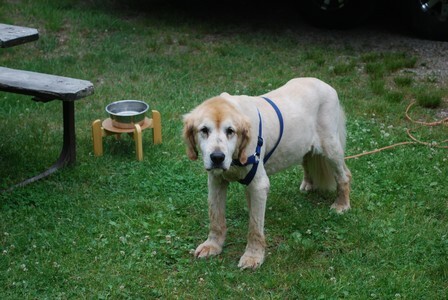 ), Al is hoping that there are no poison ivy or oak plants there! 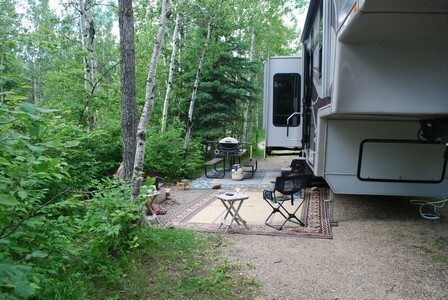 We are at Traveller's RV "resort"on the perimeter highway in east Winnipeg and today is our second day here. 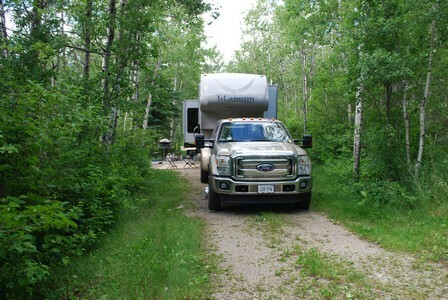 We spent Sunday night at Crystal Lake RV park in Vermilion Bay Ontario, it was a short run from Ear Falls but we wanted to break up the distance to Winnipeg. It's been steamy here,both days were 32C+ and the air conditioner in the RV has been running virtually all day as the curbside of the RV has been pointed south west. We have used the A/C more here than we did in Arizona during the winter. We shopped today as the shopping near Riding Mountain (where we are heading tomorrow) isn't as good), there was a good Safeway here on the east side of Winnipeg. We have reserved at Riding Mountain but we will be a day early getting there, our site doesn't look occupied on the reservation website so hopefully we will be OK! We ran into a few strange drivers here, not quite as bad as Mexico but different! 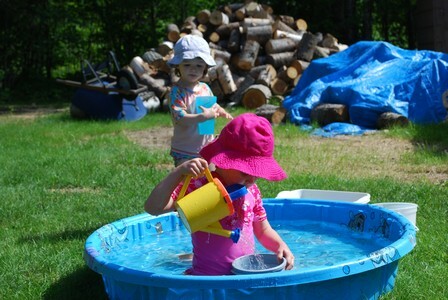 The weather in Ear Falls was warm enough and with some warm water from the hot tub the girls really enjoyed themselves! We have been ensconced here at our daughter and son in law's place near Ear Falls since Sunday. They are right on a lake and we have been enjoying walleye meals fresh out of the water. One of the joys of coming up here is to see and play with our grandchildren, every time we see them they are older and more beautiful! 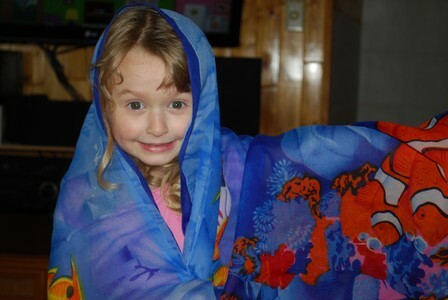 Rachelle has taken a liking to one of Suzette's covers from Mexico! We plan to stay here until Sunday then we will head west towards Manitoba. 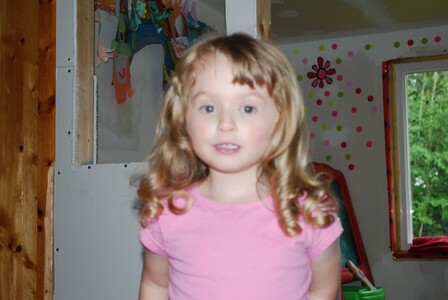 Grandkids are wonderful!! 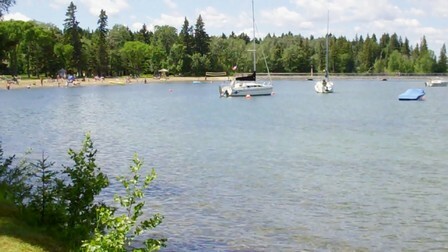 We arrived at the KOA here yesterday after the short run from Neys Provincial Park in Marathon. We spent two days in Neys and stopped in Marathon for some food and fuel. Another 5th wheel arrived in Neys on our first day there, we were amazed to see Pat and Bonnie again. We met them in Mexico during our winters there. 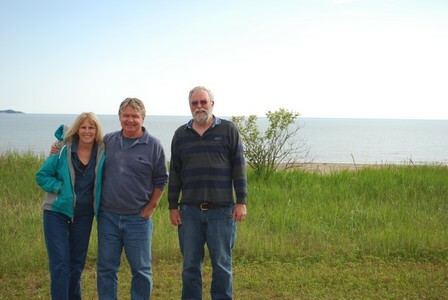 They hail from BC and are spending time in the Marathon area visiting relatives. Some time was spent renewing acquaintances and enjoying some wine! It's really a small world! 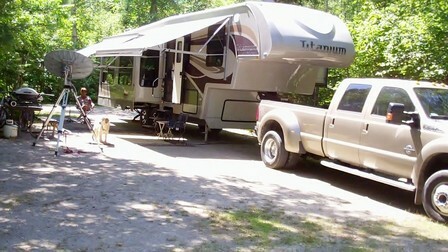 When we were in Marathon we had a look at an RV park in town, it's called Penn Lake Park and it's run by the town. There area number of full service sites on a small lake, the park looks very nice. We will try it on our way back home as it meets our needs for a short stop and is right in town. 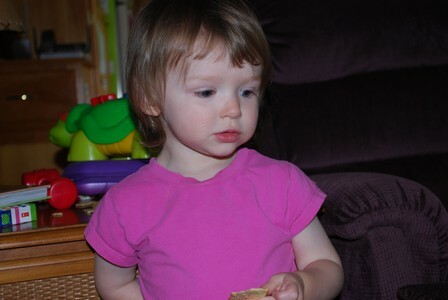 We are heading north to visit our kids and grand kids, we also plan to spend a couple of weeks in Riding Mountain National Park in Manitoba as we haven't been there in a number of years. 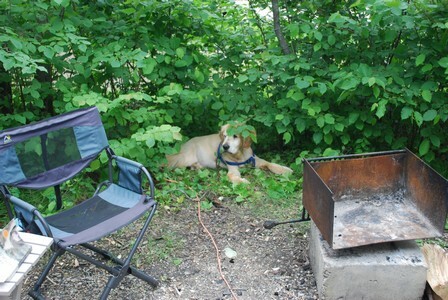 We left home yesterday and spent the night at Chutes provincial park in Massey as we usually do. 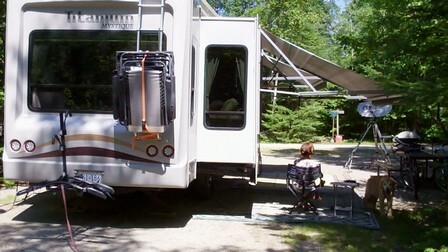 For June it's very warm, 32C yesterday and 29C today, the RV A/C has been running to keep the place cool until dark. Today we are in Rabbit Blanket campground in Lake Superior Provincial Park, although the bugs are heavy we are enjoying the stop. We are one of three campers in the campground. 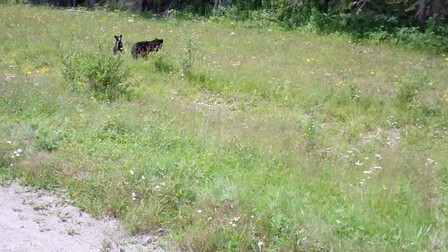 As we walked through the campground, Kasey was accosted by an angry Grouse! 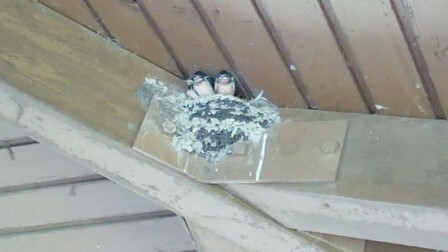 (she must have been protecting her nest). The grouse moved towards Kasey and Kasey backed off. As usual, we didn't have the camera handy, we went back twice and the grouse wasn't there. Tomorrow it's off to Marathon and Neys!